Milwaukee, WI – Affiliated Medical Services, located in Milwaukee, Wisconsin, is an independent urban abortion facility that is no stranger to medical emergencies. According to local activist Dan Miller, since February 2010, he has counted twelve ambulances that have transported abortion patients to local hospitals – including the most recent incident that took place on November 18, 2017. A search for 911 records for the November 18th incident turned up empty, an indication that Affiliated Medical Services bypasses the 911 system to avoid any public records of the incident. Instead, the abortion business contacts Bell Critical Care Paramedic Ambulance Services directly – a practice that is known to be slower at summoning help that using the 911 exchange. Without the diligent pro-life activists who have maintained a presence at Affiliated Women’s Services for years, there would be no record that this abortion facility had ever experienced an abortion complication, much less those that are so serious they require emergency assistance and hospitalization is required. 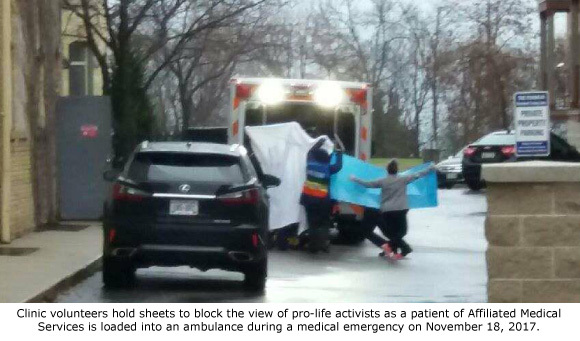 Activists recorded the arrival of the ambulance at the abortion facility at 10:15 a.m. Within minutes, paramedics removed a patient from an alley door and loaded her into the ambulance as clinic volunteers deployed sheets to block the injured woman from view. According to the Affiliated Medical Services web site, the abortion business conducts abortions through 21 weeks of pregnancy at a cost from $525 and go up to $2,500, not including a $100 fee for a state-mandated informed consent appointment that is followed by a 24-hour reflection period. A search of the online Wisconsin Department of Health Provider Search showed no record of a facility license for Affiliated Medical Services, even though high-risk surgical abortions through five months of pregnancy are done there. Previous medical emergencies at Affiliated Medical Services include one on November 30, 2006, two transports that took place on April 8, 2011, and another on July 21, 2012.